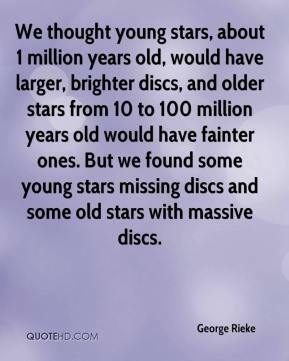 We thought young stars, about 1 million years old, would have larger, brighter discs, and older stars from 10 to 100 million years old would have fainter ones. But we found some young stars missing discs and some old stars with massive discs. 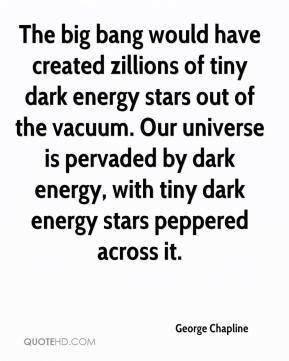 The big bang would have created zillions of tiny dark energy stars out of the vacuum. Our universe is pervaded by dark energy, with tiny dark energy stars peppered across it. 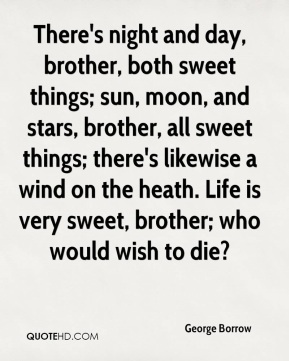 Not till the fire is dying in the grate, Look we for any kinship with the stars. 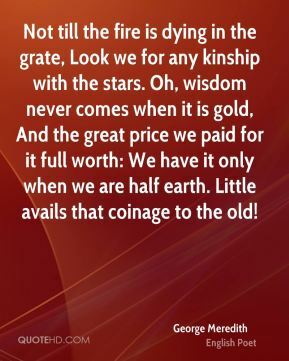 Oh, wisdom never comes when it is gold, And the great price we paid for it full worth: We have it only when we are half earth. Little avails that coinage to the old! Obviously, we don't have the bucks for big stars, so I'll be saved from having to worry about that. There are a couple of people I'd love to get, Asia Argento being first and foremost. If I could get a couple people like that, I'd be thrilled.